In her recent decision in the case of Walker v. John H. Helsel Agency, No. 2016-CV-09969 (C.P. Luz. Co. Feb. 22, 2017 Polachek-Gartley, J. ), Judge Tina Polachek-Gartley of the Luzerne County Court of Common Pleas sustained Preliminary Objections filed by a Defendant in the nature of a Motion to Strike punitive damages claims and allegations of reckless conduct in a Plaintiff’s Complaint filed in a motor vehicle accident matter. The Defendant asserted that the allegations contained in the Plaintiff’s Complaint pertained to a “run-of-the-mill” motor vehicle accident and did not rise to the level of outrageous conduct required under Pennsylvania law to support a claim for reckless conduct or punitive damages. After reviewing the current status of Pennsylvania law on punitive damages against the allegations of the Complaint, the court agreed and found a lack of facts to support of allegations of recklessness or reckless conduct as pled in the Complaint. This matter involved an intersectional motor vehicle accident. The court sustained the Defendant’s Preliminary Objections and dismissed the Plaintiff’s punitive damages claims without prejudice. The court noted that, if additional information was obtained during discovery to support such claims, the Plaintiff would be granted a right to include punitive damages at that time. The court otherwise denied other Preliminary Objections filed by the Defendant seeking the removal of allegations in the Complaint pertaining to information from the police report, traffic citations, and insurance coverage. 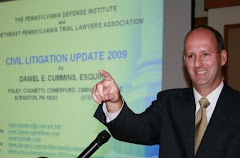 The defense counsel in this matter was Attorney Stephen T. Kopko of the Scranton, PA insurance defense law firm of Foley, Comerford & Cummins.